The Emory Thanksgiving Dinner Program pairs international students with faculty, staff and alumni hosts to help students learn more about the holiday and its place in the culture of the United States. Past participants say they have made lasting friendships. As the Thanksgiving holiday approaches, the Emory Alumni Association and the Office of International Student Life seek volunteers to host international students for the 2015 Emory Thanksgiving Dinner Program. Now in its fourth year, the program pairs international students with faculty, staff and alumni hosts to help the students learn more about Thanksgiving and its place in the culture of the United States. Many dinners are held on Thanksgiving Day, but hosts can select the most convenient date and time from Nov. 23-28. Host registrations are now open for volunteers; student registrations are currently closed due to higher numbers this year, but students can email oisl@emory.edu to be placed on the wait list. More information is available on the Thanksgiving Dinner Program website. Emory's Thanksgiving Dinner Program includes undergraduate, graduate and exchange students. The goal of the program is to expose international students to an important holiday in the United States through meaningful and authentic interactions with families, and to provide the opportunity for the host to meet international students, according to Natalie Cruz, director of international student life. "The hosts for Thanksgiving Dinner Program come from many different backgrounds and have included faculty, staff, alumni and friends of Emory. Hosts have included a CEO, faculty members, deans, Emory Healthcare and CDC employees, and many others," she says. Karen Salisbury, chief of staff in Campus Services, has hosted students for the past three years. "It has been a wonderful experience for us," she says. "One woman, (Sue) Xiaosu Tang, has been with us all three years, and we have become more like an extended family — celebrating her accomplishments and talking her through some disappointments." When Tang graduates this academic year from the Goizueta Business School, she will be very much missed, Salisbury says. Tang remembers the first time she joined Salisbury for Thanksgiving, in 2012, and "the delicious turkey she made and her adorable dogs" making her feel at home. "What I really appreciate though is the continuance of this relationship," explains Tang, who is president of Beta Alpha Psi, noting that they keep in touch with check-ins at the semester beginnings and cheer-ups during finals, plus catch-up lunches during the year. "Attending the Thanksgiving dinner my freshman year was my first step to truly get involved in American culture. That pleasant experience encouraged me to be more open and inclusive," she says, adding that she was inspired by Salisbury "to spread care and kindness in our community." Past participants praise the Thanksgiving Dinner Program as an opportunity to make friends and share traditions. "For a holiday which usually international students cannot experience with their family, this program gives us a great experience to be treated like family members as well as having the opportunity to having a nice memory," says Futu Chen, a graduate student in the Rollins School of Public Health. Erica Lee, an assistant professor in the School of Medicine, describes her family's delight in hosting Satoki Nakano, who will receive his MBA in 2016 from Goizueta Business School. "We had a wonderful dinner and experience meeting Satoki, learning a great deal from him and finding his outlook to be refreshing and positive," Lee says. "We even invited him to shop with us for Black Friday! This is a great program and we were fortunate to have the privilege to participate. We look forward to doing it again." Nakano shares Lee's sentiments. "The dinner with Erica and her family was definitely one of the best cultural experiences for me," he says, adding that it was a great opportunity to get to know someone else who is part of the Emory community. "The dinner with the International students gave my family an opportunity to share a fun American tradition with students from China, get a taste of traditional Thanksgiving food and share points of mutual experiences in China as my son had lived in China," says Sandra Maryman, faculty consultant in the School of Medicine. Ashley Carraway 08T calls the program "an amazing opportunity for alums." 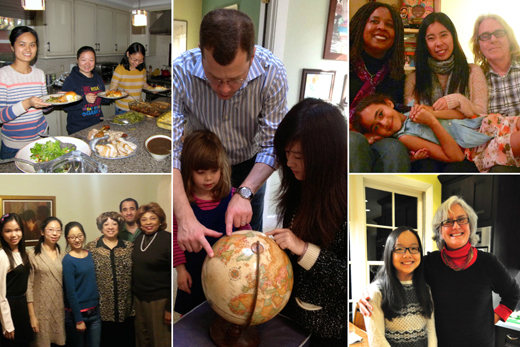 "The conversation over dinner proved a perfect vehicle for sharing and learning across cultures," she says. Shirley Connelly, associate director of donor fund reporting, says her family has made "lifelong friends" with some of the students they have hosted for dinner. "The students are genuinely happy to be welcomed into our home and to have dinner with an American family and see a roasted turkey," she says. Connelly's father served in the military and invited soldiers to their home for the holidays when she was a child, and she sees the Thanksgiving Dinner Program as a continuation of that tradition. "As long as I can remember, we have always entertained strangers for Thanksgiving," she says, "and most often they have become friends." In addition to the Thanksgiving Dinner Program, the Office of International Student Life partners with the Office of Spiritual and Religious Life and the Office of Undergraduate Education to host a traditional Thanksgiving meal on campus for international and domestic students to share experiences together. This year's event is set for Thursday, Nov. 19, in Brooks Common at Cannon Chapel. There will be two seatings: 7 p.m. and 7:45 p.m. Attendees are encouraged to bring a canned food item, blankets, jackets or other gently used clothes to donate to help others. Reservations are required; sign up here.